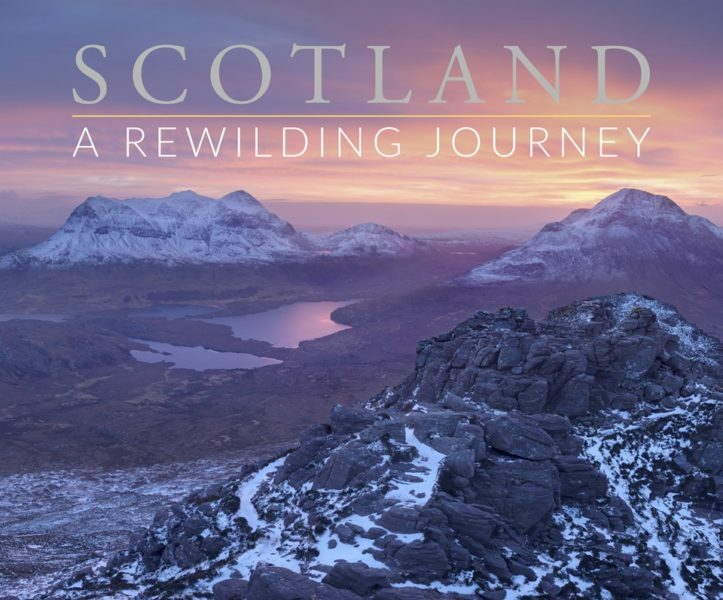 It’s not often that a book is stunningly beautiful to look at but also conveys an important message – but “Scotland – A Rewilding Journey” may be one such. This new book is published by Scotland: The Big Picture, a not-for-profit social enterprise set up by a group of Highlands-based conservation photographers. Their track record is a strong one, with previous books including a study of the red squirrel, and – earlier this year – ‘The Lynx and Us’ which took an in-depth look at what it might be like if Scotland decided to reintroduce the lynx. This new book, however, feels like a more complete attempt at a statement of what the group stands for and what they are trying to achieve. The first thing that strikes you is the aesthetics. Peter Cairns and Mark Hamblin have long been at the forefront of Scottish nature photography, known for producing images that are not just a portrait of Scotland’s most charismatic creatures or of its most beautiful landscapes, but that really set our wildlife in its natural environment. In recent years they’ve been joined by the equally talented James Shooter, who has added more mountain photography and stunning drone shots to the mix. Richard Shucksmith has contributed some striking underwater and aquatic images and with several other photographers also featuring the book is truly a visual feast. The production quality and clean design of the book stand out too – this is really a book you’ll want to keep on your coffee table rather than relegating to the shelf. All these beautiful images are, however, there for a purpose. The main text of the book by Susan Wright, Peter Cairns and Nick Underdown describes how Scotland’s landscapes and nature have been depleted through centuries of misuse. Most of our native woodlands have been lost, top predators have been driven to extinction, once rich habitats have become degraded. Not all of this damage is immediately obvious to first time visitors, but the more you look and think the more you learn to see and understand. The American ecologist and writer Aldo Leopold wrote that the “One of the penalties of an ecological education is that one lives lives alone in a world of wounds. Much of the damage inflicted on land is quite invisible to laymen.” Leopold’s 1949 book ‘A Sand County Almanac’ has been described as the greatest of all works of nature writing, and it is quoted liberally in these pages – a good thing as he had a remarkable way of distilling complex ideas into pithy and memorable phrases. The main text is complemented by sections from several guest writers. The charity Trees for Life sponsored the production of the book, and in their introduction they describe their efforts to restore and rebuild a part of what was once Scotland’s great Caledonian pine forest in all its diversity. The naturalist Sir John Lister Kaye writes strikingly of the decline he has witnessed in Strathglass since he moved there in 1969, when “in the pinewoods I could always put up a capercaillie or a trio of black grouse… No so now.” He describes the decimation of wildlife carried out in Victorian times but then laments that the losses “appear to have escalated faster in my lifetime than in the whole of recorded history.” On a more optimistic note Dr Duncan Halley looks at Norway, which in the first half of the twentieth century had become as depleted as Scotland. Following a sharp reduction in grazing pressure the landscape there has since been transformed, with natural woodland regeneration occurring on a huge scale with little intervention – showing just how much could be achieved in the Highlands, where the weather and soils are very similar. Howard Wood takes a look at the seabed, applauding the recent designation of Marine Protected Areas and arguing for no-take zones to operate alongside them. Steve Christie writes of the ever-growing importance of nature tourism, the business sector that looks most likely to continue to provide growing employment in the Highlands – and ponders on what future visitors – as they become better educated – are likely to be looking for. Ruth Tingay – the main author of the Raptor Persecution Scotland blog – argues that as a society we have been wilfully blind to the modern intensification of grouse moor management and the illegal killing of birds of prey that has gone along with it. Her campaigning has done much to help force us – and our politicians – to begin to open our eyes. The Highland Clearances were themselves part of the process of exploiting and extracting from the landscape – first for overgrazing by sheep and then for game species, and doing so regardless of the wider effects on other people and on nature. If unsustainable exploitation takes place in the future, it will matter little who is doing it – what we need to do is learn how to live with the land, not against it. The book attempts to do more than simply illustrate our ills; it tries to map out a route to a better future. It covers the success stories – the startling recovery of nature in places like Creag Meagaidh and in Glen Feshie; the beginning of the restoration of peatlands, living landscape projects which bring wild nature back even to areas around our towns, the return of once lost species like the osprey and the beaver. In one of his most famous essays “Thinking Like a Mountain” Aldo Leopold vividly described all the different ways in which the howl of a wolf was perceived – both by animals on which it preyed, by farmers who feared for their stock, and by hunters who saw in it an exciting challenge. He went on to describe how he took part in the killing of a group of wolves – without guilt, as at the time he thought that the extermination of wolves would be a good thing both for deer and people. “I was young then, and full of trigger-itch; I thought that because fewer wolves meant more deer, that no wolves would mean hunters’ paradise. But after seeing the green fire die, I sensed that neither wolf nor mountain agreed with such a view.” Eventually he saw the effect of the loss of the wolf, as deer numbers increased and the landscape became overgrazed, and he came to see and argue for the essential role of predators in any landscape. The power of his essay goes beyond this, however, as it dramatises our ability to really learn from our past mistakes and to develop; to begin to take a wider, more considered view – to learn to ‘Think Like a Mountain’. What the book argues is that making a better future will not just mean achieving political change, or even changes in Scotland’s inequitable land ownership. Many of us tend to look to politics for our answers, but that may be to put the cart before the horse. What we really need is a change in ethics – for people to learn to take a broader view that looks beyond their own personal or financial interest. We need to extend our ethical outlook to see nature as something we must protect and respect, just as we should also respect other people and our communities – that’s “The Big Picture”. The fact is that farming, tourism, hunting and every other human activity can be done either in sustainable ways that respect nature and will allow it to thrive and grow, or it can be done in ways that destroy and damage it. Scotland has long had plenty of examples of private landowners who have played a role in degrading and denuding the land – but then also there are landowners like Anders Povlsen who have brought huge positives and restoration too. The record of our public bodies managing the land isn’t uniformly great either – witness the drainage of large areas of the flow country, the vast blanket afforestation with non-native species carried out historically by Forestry Commission Scotland, or even today calls by Highlands and Islands Enterprise for developments that could damage the wider nature-based tourism of the future. What we need is a change in thinking and in ambition. We need to see more projects like Cairngorms Connect that has seen private, public and charity landownership all acting together in a joint effort try to improve the landscape on a much wider scale than any one body could achieve alone; this is the way forward. What really matters is winning a change in people’s hearts and minds so that they see that – as Leopold said – “a thing is right when it tends to preserve the integrity, stability and beauty of the biotic community. It is wrong when it tends otherwise”. When enough people learn to think like this, then and only then will the political change needed to permanently enrich the nature, people and economy of the Highlands really follow. Scotland – a Rewilding Journey costs £25 in hardback and is available from Scotland: The Big Picture.